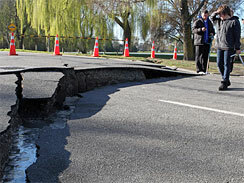 The Earthquake Commission and insurers have agreed on a new process that will go some of the way to streamlining how claims involving EQC and private insurers are managed. Lance Dixon, a spokesperson for the EQC has outlined to interest.co.nz a new protocol on how claims will be managed where both private insurers and the EQC are involved in the same loss. With the EQC providing cover to a maximum of only $112,500 ($115,000 post the 1 October GST rise) on houses and $22,500 ($23,000) on contents and many claims that will certainly exceed these limits, then cooperation between the two insurers will be vital. In the past there has been limited cooperation, with EQC and insurers managing their claims independently. This has to some extent seen a double up on the resources required to manage the loss. It has involved one loss adjuster for EQC and a different loss adjuster for the insurer. For this event the Insurance Council and the EQC have developed a more streamlined approach. Where a claim is likely to exceed the loss limits of EQC or where cover is limited and private insurers will be involved, then EQC and private insurers have agreed to the sharing of information and resources. This will eliminate the double up on key resources like insurance assessors whose reports will be used by both parties. The EQC are expecting at least 75% of approximately 150,000 residential properties in the Christchurch region to lodge claims. Of these many will spill over to private insurers. This will be where the damage is in excess of the limits of EQC cover or where there are differences in the cover provided. Examples of this would be in relation to swimming pools which are not covered by EQC but are covered by private insures. Retaining walls are covered by EQC for 'market value' and are covered by some private insurers for replacement. Under contents policies, EQC excludes some items such as jewellery and this is insured by private insurers. It can become very confusing and messy for customers. For example, EQC pays claims irrespective of the status of the claim with the private insurer. Normally they will check if a property is mortgaged and then ask the mortgagor if the payment is to be made to them or the customer. According to EQC, around 70% of claims end up being paid direct to the insured. This provides a complication to the private insurer who has a reinstatement policy based on sq meters, and there is a shortfall, is the EQC claim money to be paid directly to the customer? There have been many instances where that money has been used for other purposes, such as a new car or uninsured losses and is not available to contribute to the reinstatement. In other cases if the customer has had issues around the payment of their mortgage then their lender can insist the payment is made to them and again is not available to be uses to reinstate the property. It puts the private insurer in a very awkward position. In a practical sense the industry sees the best solution to be for a change to the law, where this amount is paid to the insurer who can offset it against their reinstatement costs for the property. It will be an interesting 'dummy run', pun intended. Those of us who contemplate life beyond 'peak', have long come to the conclusion that the building regs would have to be unwound - amongst others. But unwound with oversight is something we hadn't predicted, we thought the 'powerdown', or the 'long emergency', would be driven bottom-up by societal need-to. This will be top-down, a useful reference.